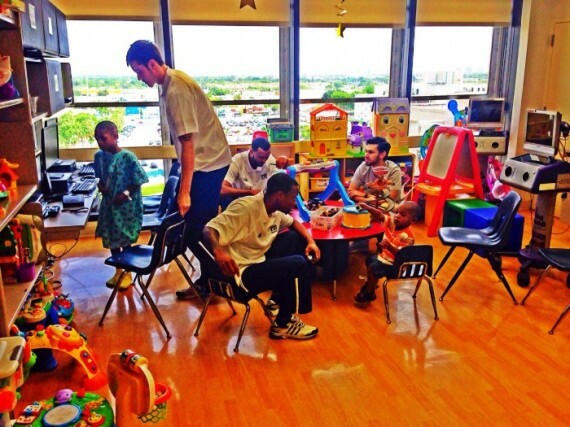 FIU men’s basketball players spent time with patients at Lou Holtz Children’s Hospital during the summer. Growing up with a father and uncles who helped him become the man he is today, men’s basketball senior guard Marco Porcher Jimenez knows how important good role models are in life. Because of the role they played in his life, Jimenez embraces the opportunity to encourage and give hope to children whom may not have a mentor or father figure in their lives. This summer, Jimenez and his teammates took part in a number of different community service initiatives, including volunteering at Chapman Partnership where they held a basketball clinic for the elementary-aged kids residing at the homeless shelter. FIU student-athletes have worked on a wide variety of projects and outreaches in the community through the years, from the men’s soccer team helping serve lunches to the homeless at Miami Rescue Mission to members of the football team speaking to students at Pine Villa Elementary about the importance of education and hard work. Assistant Athletic Director of Student-Athlete Development Liz Agustin, who helps arrange and organize different events and outreaches, says she has seen more student-athletes take the initiative when it comes to going out into the community and volunteering their time. For student-athletes, it’s also an opportunity to work on skills such as communication, leadership and networking that will help them long after they leave campus. But more importantly, many want to have a positive influence on those whom they serve. Since the beginning of the Fall 2008 semester, FIU student-athletes have completed more than 25,250 hours of service in the community. From the beginning of the Summer 2013 semester to the end of the Spring 2014 semester, they logged a total of 4,256 hours of community service. This summer alone, student-athletes from all teams volunteered 273 hours in the community on a variety of projects. The football team volunteered at the Miami Football Festival organized by the Miami-Dade Parks and Recreation Department, providing football training and motivation for the children attending. They also organized a “Panther for a Day” event for disabled kids attending Camp Cantecumbe. Wide receiver Richard Burrows, who completed his internship at the camp this summer, came up with the idea. Student-athletes from men’s basketball, football, women’s soccer, men’s and women’s track and field visited with patients at Lou Holtz Children’s Hospital – even celebrating many birthdays. 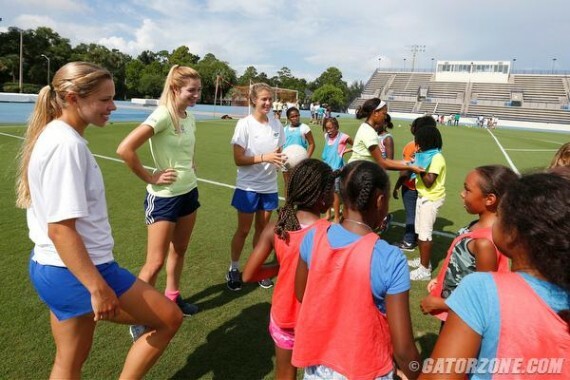 The women’s soccer team partnered with the Florida Gators to host a soccer clinic for Girl’s Place, a local non-profit organization in Gainesville, FL. Together, the two teams helped teach small groups of girls technical soccer skills and played fun games like red light, green light. The FIU women’s soccer team partnered with UF to hold a soccer clinic for Girl’s Place, a non-profit organization in Gainesville, FL. Women’s soccer has consistently led FIU Athletics in community service. From Summer 2013 to Spring 2014, the team’s members put in 1,100 hours of service. Women’s soccer midfielder Sara Stewart served the highest number of hours in the community this summer, volunteering 171 hours at two animal clinics while visiting her hometown in Canada. Stewart, a redshirt junior majoring in biology, is an aspiring veterinarian and helped staff members at the clinics care for all types of animals – common house pets, racehorses and show horses.